Dritte Schlappe R. Köppel/A. Baur WELTWOCHE / third defeat in Court for the newspaper WELTWOCHE against the whistleblower! Third victory against WELTWOCHE, KOEPPEL, BAUR here the link to Sonntagszeitung confirming third victory of whistleblower Rudolf Elmer! "Project: To take the case against WELTWOCHE, ROGER KOEPPEL and ALEX BAUR to the Higher Court of Zurich. Rudolf Elmer expensed for the partial victory at the lower court of Zurich fees of approx CHF 40`000 already. The funds will be entirely used for the legal cases and figures will be made public. 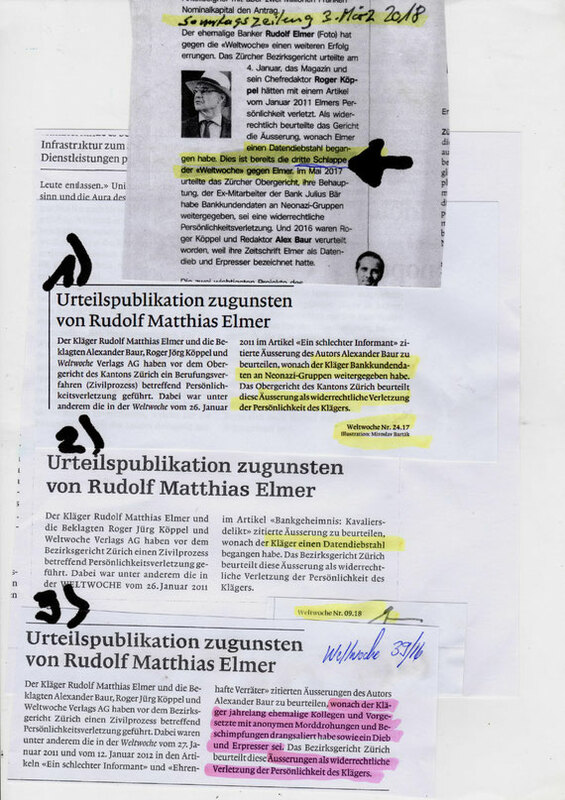 The complaints Rudolf Elmer filed in favour of Society are not financed at all at this stage!